The United States and Russia both failed on Thursday in rival bids to get the United Nations Security Council to take action on Venezuela, cementing a global split over how to deal with a political and humanitarian crisis in the South American country. Russia and the US have been at loggerheads over a US-led campaign for international recognition of Juan Guaido, the Venezuelan opposition leader and head of the country’s elected National Assembly, over President Nicholas Maduro. Guaido last month declared himself the interim head of state. Russia and China vetoed a US-drafted United Nations Security Council resolution calling for a free and fair presidential election in Venezuela and unhindered aid access. The US text garnered a minimum nine votes – forcing the double veto, while South Africa also voted no. Three countries abstained. “By voting against this resolution some members of this council continue to shield Maduro and his cronies and prolong the suffering of the Venezuelan people. 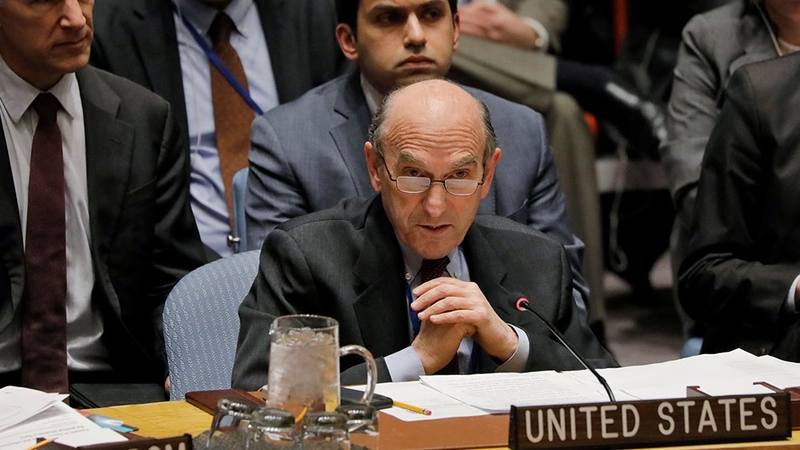 This man-made crisis has extended well beyond Venezuela’s borders and threatens to destabilize the region,” US special envoy for Venezuela Elliott Abrams told the council. The council then voted on a rival Russian draft that aimed to express support for a political solution and back the Venezuelan government as the primary coordinator of international assistance efforts in the country. The Russian text failed after only four council members voted in favour of it. Four abstained and the rest were against. A council resolution needs nine votes in favour and no vetoes by Russia, China, France, Britain or the US to pass. “We are seriously concerned about the fact that today’s meeting may be exploited as a step for preparations of a real, not humanitarian, intervention … as a result of the alleged inability of the Security Council to resolve the situation in Venezuela,” Russian UN Ambassador Vassily Nebenzia said after the vote on the US draft resolution. US President Donald Trump has said all options are on the table in dealing with Venezuela, although Abrams has denied Russian accusations that Washington is preparing to intervene militarily. Ahead of the Security Council votes on Thursday, French UN Ambassador Francois Delattre, in support of the US-drafted resolution, said it “does not represent a legal basis for a use of force, nor an attempt to undermine the sovereignty of Venezuela”. The US and dozens of other nations have recognised Guaido as Venezuela’s legitimate president, but Maduro still controls the military, state institutions and oil company Petroleos de Venezuela SA (PDVSA), which provides 90 percent of the country’s export revenue. “The Venezuelan affairs should be decided by the Venezuelan people,” China’s Deputy UN Ambassador Wu Haitao said. The US targeted Venezuela’s government with new sanctions on Monday and called on allies to freeze the assets of state-owned PDVSA after deadly violence blocked humanitarian aid from reaching the country over the weekend. “If there are threats against peace, those threats come from abroad,” Venezuela’s UN Ambassador Samuel Moncada told the Security Council on Thursday.